The D-3100HB 3U Compact 10 x 3.5" HDD Bay Hotswap microATX Chassis from iStarUSA is designed for Home Theater Personal Computer (HTPC) or media center computer usage. The elegant and functional chassis is suitable for both rackmount and desktop orientation, and features a black HDD handle. With a storage capacity of up to 8TB for each bay, the hot-swap drive cage maximizes data storage and backup functionality at the same time. 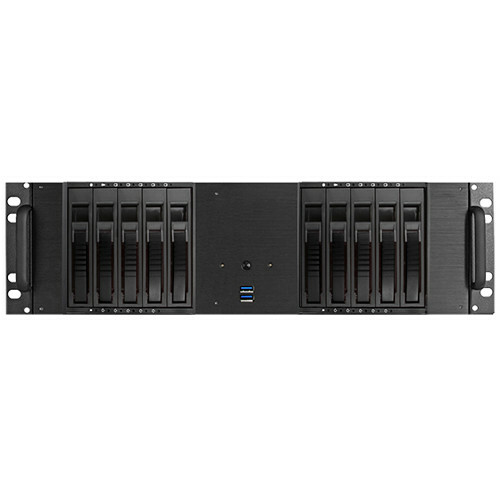 This audio / video rackmount chassis is a suitable platform for HTPC builds using popular AMD and Intel processors. External Drive Bays 10 x 3.5"